Figure 1. The scaly annular eruption, four months after onset. Figure 3. Erythema annulare centrifugum. A 10-year-old girl presents with a four-month history of a scaly annular eruption that has been gradually evolving on her trunk (Figure 1). It is mildly itchy, but not severely enough to wake her at night. Tinea was initially suspected, but skin scrapings for fungal infection have returned negative results. The patient has not had any recent contact with pets or other animals, and treatment with antifungal creams has been ineffective. There are many causes of annular eruptions. The diagnoses to consider in a child of this age include the following. Tinea is a common fungal infection and usually the first suspect for a scaly annular lesion. Tinea that produces the classic ‘ringworm’ appearance has often been acquired from a pet rodent such as a guinea pig or mouse; cats and dogs are less common vectors. The edge of the lesion is scaly and erythematous, and itch is a feature. A diagnosis of tinea is easily made by taking a scraping of the scaly edge of the lesion – direct microscopy is available within 24 hours but culture commonly requires three to four weeks. Unless the lesion has recently been treated with an antifungal agent, a negative test result will usually rule out a diagnosis of tinea. Granuloma annulare is a very common idiopathic condition. Lesions are slowly progressive. It is characteristically asymptomatic and not scaly and does not usually produce more than a few lesions at any one time. Typical sites are the dorsum of the hands and feet, the elbows and knees. Pityriasis rosea is presumed to be a reaction pattern to a viral infection, although the viral cause has not been isolated. It can produce multiple scaly lesions, annular to ovoid in shape with a band of scale on the inner aspect of the annular edge (Figure 2). Lesions are usually located on the trunk. The condition is usually asymptomatic and always self-limiting, disappearing spontaneously after about six weeks. 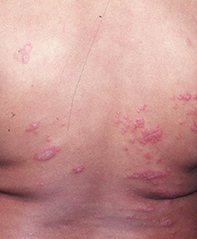 Cutaneous lupus erythematosus can produce annular lesions, which may be scaly and often have an atrophic centre. They are most commonly found on sun-exposed skin surfaces. Lupus erythematosus is seen in children, but it is very rare. 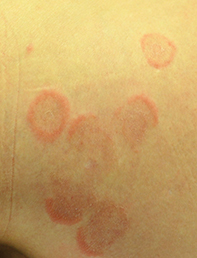 Erythema annulare centrifugum presents with a relatively small number of polycyclic (rather than annular) lesions with an erythematous edge and with scale on the concave side (‘trailing scale’) – see Figure 3. It is asymptomatic and may persist for years. The lesions slowly migrate and are not responsive to topical corticosteroid treatment. 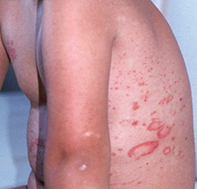 Erythema annulare centrifugum is a very rare condition of unknown cause and can occur in children. Psoriasis is the correct diagnosis in this case. It is unusual for the lesions of psoriasis to be so strikingly annular; clues to the diagnosis include the presence of other, more typical lesions on the rest of the skin (such as the dorsal surfaces of the elbows and knees), nail pitting and a flaky scalp. Although parents commonly deny a history of psoriasis when asked, it is interesting how many of them have a mild degree of it when examined. Children with psoriasis often have a history of cradle cap and nappy rash as babies. Other common inflammatory dermatoses in children, such as eczema, are not annular and are usually very itchy, waking the child at night. Although psoriasis has a characteristic histological appearance, biopsy is rarely necessary. The condition responds to treatment with moderate to potent topical corticosteroids and, as it is chronic condition, maintenance therapy is often required. In children, ointments and creams containing tars such as liquor picis carbonis (LPC) are good preventive measures and should be applied daily after a remission is induced with topical corticosteroids. Natural sunlight is helpful for psoriasis, and more severe cases can be treated successfully with ultraviolet phototherapy.